Is It Wrong To Celebrate Bin Laden's Death? 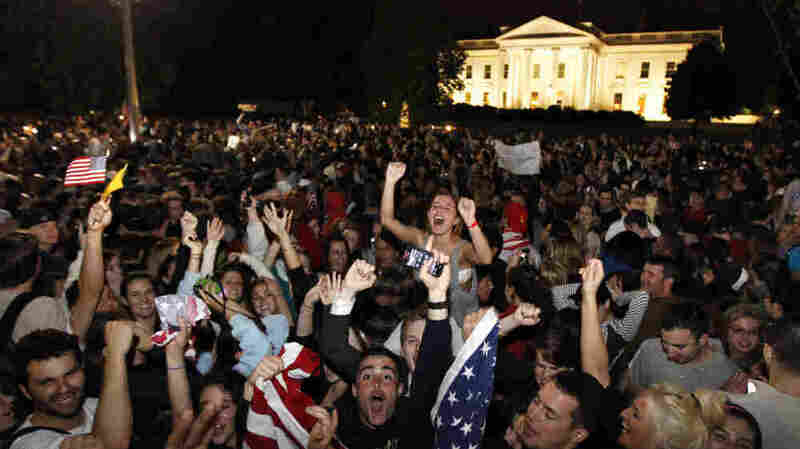 Displays of joy erupted near the White House and ground zero in New York in reaction to news that Osama bin Laden had been killed. Some found the celebrations — even of the death of a widely hated figure — morally troublesome. Is It Wrong To Celebrate Bin Laden's Death? Impromptu celebrations erupted near the White House in Washington and ground zero in New York when news of Osama bin Laden's death was reported and tweeted. Laura Cunningham, a 22-year-old Manhattan reveler — gripping a Budweiser in her hand and sitting atop the shoulders of a friend — was part of the crowd at ground zero in the wee hours Monday. As people around her chanted "U-S-A," Cunningham was struck by the emotional response. She told New York Observer: "It's weird to celebrate someone's death. It's not exactly what we're here to celebrate, but it's wonderful that people are happy." Those mixed feelings get at the heart of the moral ambivalence of the moment: Of course there is relief that an evil mastermind cannot commit acts of terror in the future. But is it ever a good idea — from a spiritual or philosophical standpoint — to celebrate with beer and good cheer over the death of anyone, even a widely acknowledged monster? The Roman Catholic Church responded to the news of bin Laden's death with this statement: "Faced with the death of a man, a Christian never rejoices, but reflects on the serious responsibility of everyone before God and man, and hopes and pledges that every event is not an opportunity for a further growth of hatred, but of peace." "I think that's on the mark," says Mike Hayes, a campus minister at the University at Buffalo. "As a Catholic Christian, I cannot celebrate the death of anyone, especially when it is done violently. Naturally, my human nature fights against that idealism, especially when I think of those who I lost personally that day and all those who lost their life on 11 September." However, adds Hayes, who runs the Googling God blog for young adults, "I don't think that the celebrations in the streets were our finest moment as Americans, and reminded me much of the anger I felt at seeing Afghans dancing in the streets at the fall of the Towers on that dreaded day." Hayes says: "We are called to forgiveness. And that is the only way that we can be truly free. Holding onto our hatred keeps us in slavery to bin Laden's madness and gives the terrorists continued power over us." There is also a sense of false elation, he adds, "because many believe that the world is a safer place because of this death. That relief is probably misguided." Still, some Americans are wrestling with the rightness and wrongness of the party-like responses. A popular status update on Facebook today is a quote attributed to Mark Twain: "I've never wished a man dead, but I have read some obituaries with great pleasure." On a practical level, some people are concerned that such public displays of elation — similar to those following a sports victory or a political election — will create more animosity and even greater danger. "This closes a chapter, but the most sobering aspect of this is that this is not the end," Jack Cloonan, a former FBI special agent, told The Huffington Post. "The reasons they hate us have not subsided, and this could reinvigorate things." And the question remains: Is there moral philosophical justification for rejoicing over the demise of someone like bin Laden? "Most people believe that the killing we do in war is justified as the only way to disable an enemy whose cause we believe to be unjust," says Christine Korsgaard, a philosophy professor at Harvard University. "And although it is more controversial, many people believe, or at least feel, that those who kill deserve to die as retribution for their crimes. "But if we confuse the desire to defeat an enemy with the desire for retribution against a criminal, we risk forming attitudes that are unjustified and ugly — the attitude that our enemy's death is not merely a means to disabling him, but is in itself a kind of a victory for us, or perhaps even the attitude that our enemy deserves death because he is our enemy." It is important, Korsgaard says, "not to confuse the desire for retribution with the desire to defeat an enemy. But because terrorism partakes of both crime and war, it is perfectly natural, and perhaps legitimate, to have both of these attitudes towards Osama bin Laden: to think that we had to disable him, and to think that he deserved to die." The two sentiments should be kept apart, she says. "If we have any feeling of victory or triumph in the case, it should be because we have succeeded in disabling him — not because he is dead."